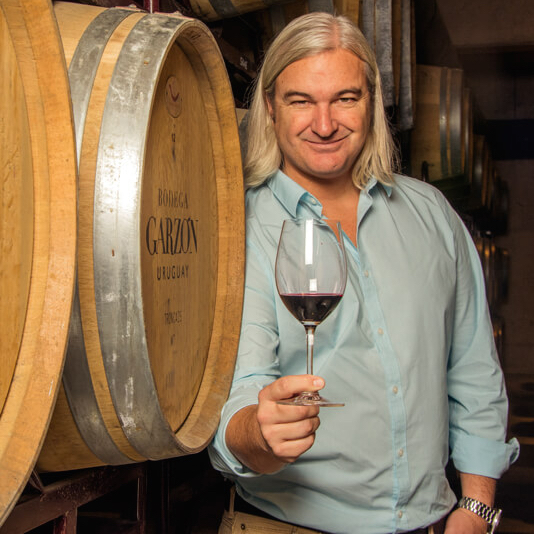 Based in Garzón, Christian Wylie is responsible for the entire winery and all aspects of its operations – production, winemaking, viticulture, marketing, sales management, hospitality, and tourism activities. As General Manager, Wylie brings nearly twenty years of wine industry experience along with additional business management skills. Wylie has an impressive track record with family-owned and managed businesses, including senior leadership roles at Carolina Wine Brands in Chile and Establecimiento Juanicó from Uruguay. He holds an agricultural engineering degree with a specialization in fruiticulture and enology from the Catholic University of Chile. He also studied at the University of California at Davis, and completed a post-graduate senior management program at the ESE Business School in Chile. One of Wylie’s passions is traveling the globe. Brining food, wine, and different cultures together is the epitome of his new role at Bodega Garzón as the winery leads the charge for the emerging Uruguayan wine industry. Being situated at the nexus of the active lifestyle with José Ignacio and Garzón, Wylie and his family are excellent representatives of the region.